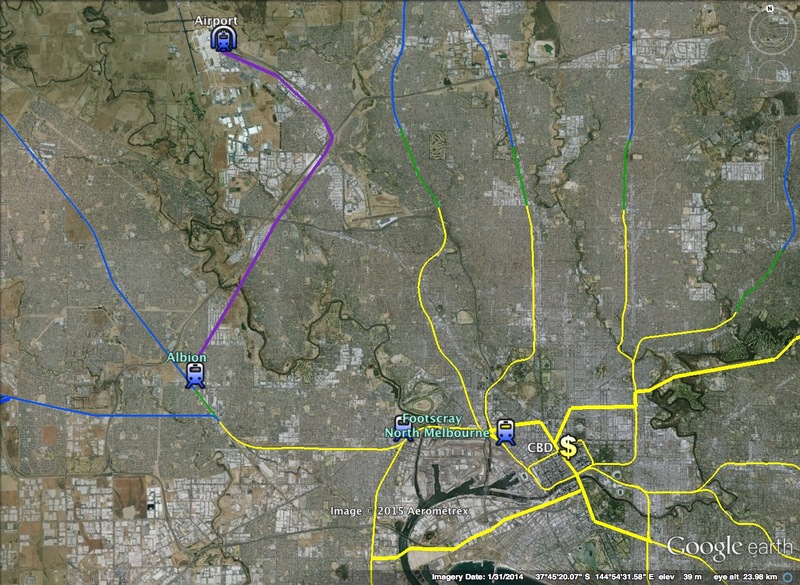 My plan provides for TWO airport routes. The first follows the recommendations of the Liberal government's working group. I agree that electrifying the existing Albion freight corridor is easily the cheapest and most effective solution. I do, however consider it madness, based on our earlier blackspots analysis to do this without adding any new stations to service the large blackspot the route runs right through. 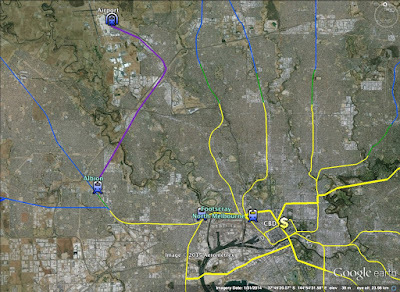 So this first "Airport" route would cater for passengers transiting to and from the CBD, departing Southern Cross via the existing Sunbury line to Albion, and along the new corridor from there. I would propose a limited express service, stopping at North Melbourne, Footscray, Gladstone Park and Albion. I'd strongly suggest the use of modified rolling stock that allowed for significant luggage storage areas on this dedicated service. I'd also strongly suggest a long-run needs assessment before making this investment, as demand is unlikely to be such that we'd need to be running six car sets. You'd want to keep a reasonable service frequency, and so smaller sets of rolling stock would probably be the most cost effective approach. I have tried to apply some sort of notional cost-benefit approach to the solutions I'm putting forward, and I do think we need to be very clear that the working group study showed very clearly that this would not be a profitable enterprise until Tullamarine was generating a significantly higher number of passenger movements. Thus, what I'm putting forward here in part three would probably form a "stage two" of network development. However, what I am about to propose by way of a second airport route is actually the network development project that would truly transform the nature of the rail network, and simultaneously work to activate a vastly expanded set of CAD centers. 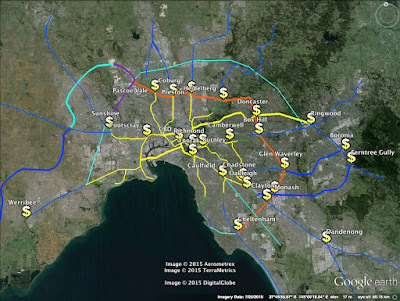 Much has been written and said about the way in which improvements in the transport network overall - and particularly Melbourne Metro Rail are set to accrue the majority of their benefits to the already relatively well-off, well networked, denizens of the inner city. This is somewhat silly, as the point of Metro Rail is as much as anything removing the City Loop capacity constraint from the entire network, thereby actually enabling the entirety of the network extensions I've proposed to date. Nonetheless, my plan does radically reconceive the transport possibilities for outer suburban residents through the creation of a new Outer Circle orbital route. This is where things get really expensive. We discussed in part two the possibilities of multi-modal technologies to deliver suburban rail extensions, and that approach should certainly be applied to planning for an Outer Circle. But reality is, this, as you'll note from the map below, this is about retrofitting rail into established but poorly-catered areas, and the route traverses a number of green wedge zones. There's no getting around the fact that however you did it, you'll almost certainly be faced with a bill running to hundreds of billions of dollars by the end of the exercise, as the bulk of it is going to have to be underground. But if we believe that the benefits of radically revisioning this city's transportation patterns far better around nominated CADs are liable to be exponential, and I most certainly do believe that, you can justify an exponential level of expenditure if that's needed to enable it all. The other point here is that if the benefits from this scale of investment are to be exponential, the opportunity costs of NOT proceeding need to be treated as real. If you believe not re-working Melbourne's transport is liable to impose an artificial constraint on the city's entire economy as commuting and related delays reduce productivity across the board, then once again this is something that SHOULD be included on your cost-benefit. And finally, of course, if under Greg Hunt's scheme we're willing to spend hundreds of billions undergrounding existing routes to provide not one extra iota of utility to anyone, spending the same in a way that is actually calibrated to deliver real, tangible and transformative benefits most certainly deserves to stay on the table. So, here it is. An orbital route running from Cheltenham in the South-East to connect ALL existing and proposed routes, excepting Alamein, Sandringham, Melton, Werribee and Williamstown. I'll discuss reasons for their exclusion shortly. Suffice to say I've allowed provision for further extensions so longer-run it need neglect only the more truncated Alamein and Williamstown routes. The new track is orange in the image above. It is proposed the route would run TWO destinations from Cheltenham - one "Airport", the other "Albion". And it is trains from THIS, rather than the direct CBD-airport route which will service the newly created stations at Keilor, Gladstone Park and Gowanbrae. 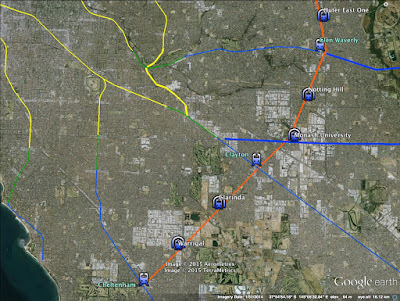 Passengers commuting to the CBD from these stations would be required to change at Albion. You'll note a plethora of new stations along the route. These have been selected seeking to optimise the CAD effects around established mixed use zones with existing infrastructure. It is THIS project, which pushes the network most in the direction of our vaunted "four spokes" ideal of catering for radial travel into CADs. 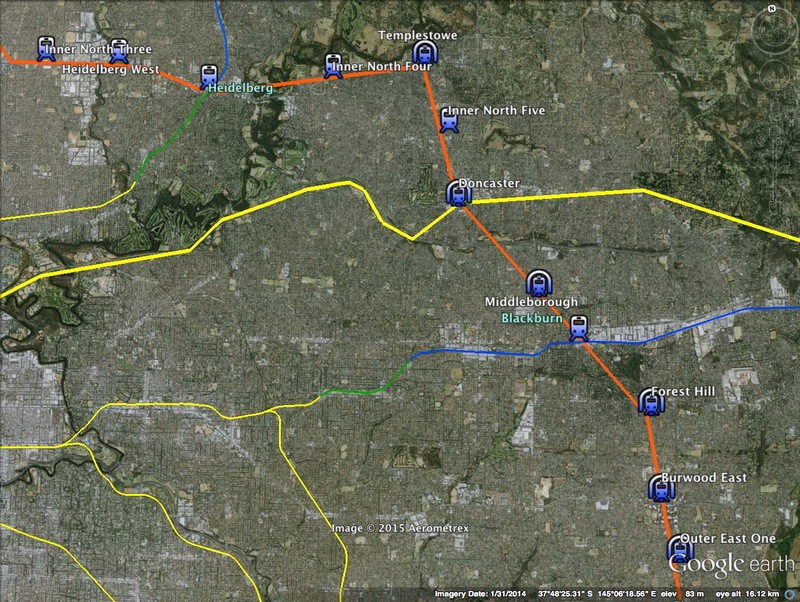 This covers five of the existing six CADs - Box Hill, Dandenong, Footscray, Ringwood, Frankston (not shown) and Broadmeadows (not included). 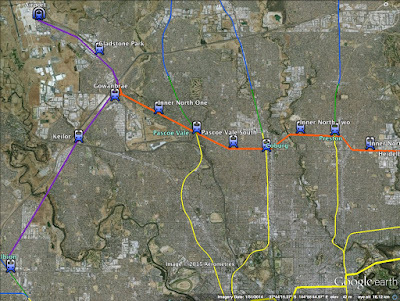 While there are certainly arguments to say Broadmeadows has plenty of natural factors that ought to recommend its inclusion within broader CAD policy, a transport solution giving effect to this would need to be part of any phase three development. 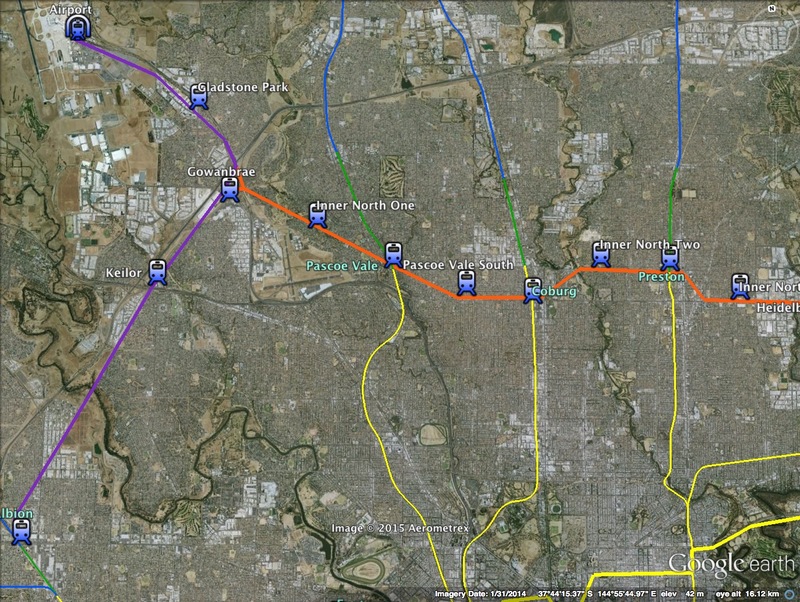 As the plan stands, Broadmeadows' catchment is unable to be expanded through heavy rail solutions. Furthermore, in spite of plenty of rhetoric to the contrary, the statistics we have seen show that the region is NOT actually a major employment hub at this time. The picture is similar in Frankston, although it has the advantage of still being the only major employment center south of Dandenong. Broadmeadows has considerably more direct competition, hence my dubiousness as to whether this is liable to occur in my lifetime. Of my new proposed CADs, only Werribee isn't depicted. 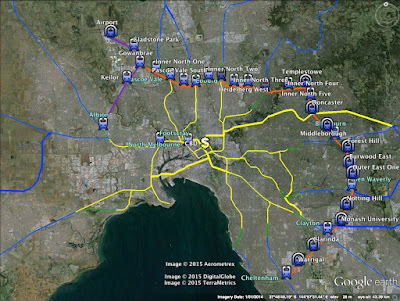 The reality is that Melbourne's east has matured and developed significantly more rapidly than its west, such that the logic is now essentially that the east is "full" and greenfields suburban developments will largely be confined to the city's west. And the whole idea of CADs is that these should be areas that have already accumulated a certain level of mixed use development, and should be employment centers and destinations in their own right. Candidates fitting these criteria are largely absent from the west at present, although this plan obviously envisages provision to expand the network along the same principles as the west develops. Regardless of what happens, Werribee starts out with enough natural advantages as a CAD, that like Frankston, it's going to remain the most likely outer western candidate for the forseeable future. 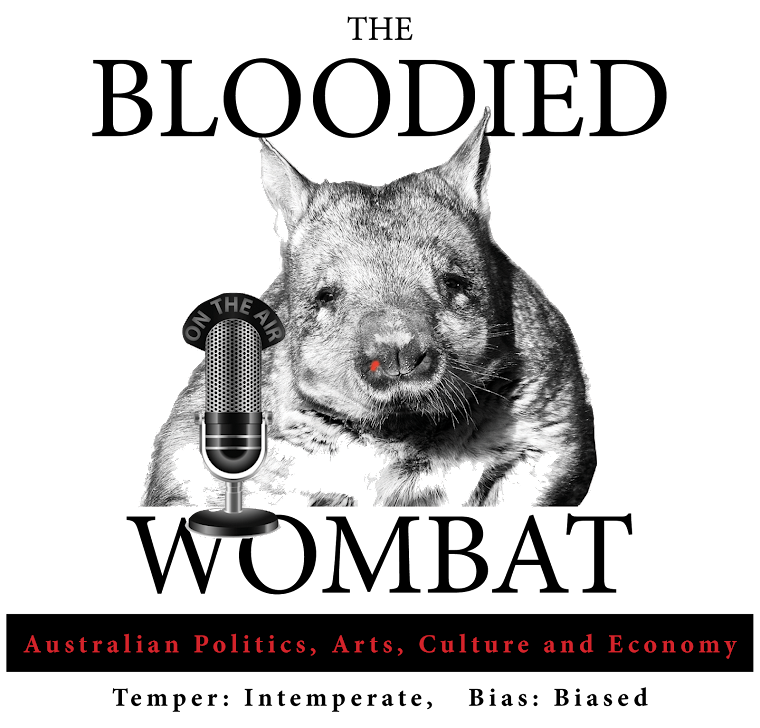 So, the 21 new CADs, west to east are: Werribee, Sunshine, Pascoe Vale, Coburg, Preston, Richmond, Toorak, Burnley, Caulfield, Heidelberg, Camberwell, Chadstone, Oakleigh, Cheltenham, Clayton, Monash, Glen Waverley, Doncaster, Ringwood, Boronia and Ferntree Gully. I've removed North Melbourne from the plan for now, because although it boasts an enormous catchment area with the confluence of so many lines, the station is busy mostly with transit passengers who never leave the concourse. The station surrounds are resolutely residential, and with high heritage values, so prospects for developing employment centers are limited. 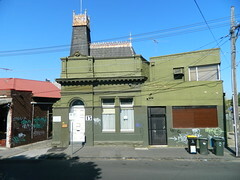 If e-Gate is pursued as a strongly mixed-use development, North Melbourne would readily find itself upgraded to a designated CAD. Richmond could be argued as a similar case, but has actually had talk of serious urban renewal efforts for a few years now, albeit with no real actual initiative, and the Cremorne light industrial area is set for significant transformation. 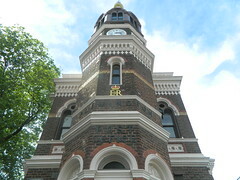 Toorak will remain in the mix regardless of any decision as to whether South Yarra will connect with Melbourne metro. This is of course an area that because of its many natural advantages is developing well as a mixed use, employment and particularly high density residential zone. So, absent of any changes to the station catchment, Toorak would be expected to continue to develop in this general direction. Chadstone is the only nominated center that relies on a "two spoke" catchment, but is already so large and such a destination that it is agglomerating at a far more accelerated pace than basically all the designated CADs. 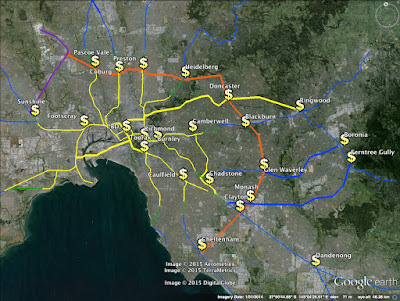 As we have seen, Monash and Clayton are also well ahead of the "vanguard" of designated CADs, and the provision of rail to both would be expected to significantly accelerate this process. The remaining centers probably need little direct commentary, other than their having been selected for obvious junction points with established mixed use areas catered to by either three or four rail "spokes". Obviously, network development of this scale would take decades to complete even if we started tomorrow. But we know enough about the specifics of Melbourne's long term development to make some very certain predictions about its needs over that timeframe. And on that basis I tender this plan as far from the only one that would meet them. But I do think it is going to be essential, in order to keep this city functioning to give the fullest possible voice to advancing CADs policy with real urgency. And I do believe that the network development needs of the public transport system DO look VERY DIFFERENT if furthering CADs policy is given the primacy it deserves. On that basis I tender this solution as the optimal I've yet seen anyone propound. I'll look quickly at what a proposed 'Stage Three development might look like, although the objectives here would be imagined to be accomodating the significant growth we'll by that time be seeing exclusively in the western suburbs. Integrating Sandringham would be one final Eastern initiative, as well as on further branch line to plug the remaining outer eastern blackspot. Then a second Outer Circle route to Ringwood would further cater to growth in the city's north. We will see in part four, which looks at the roads network, that my plan would allow for the construction of a road tunnel between Eastlink and the Ring Road. 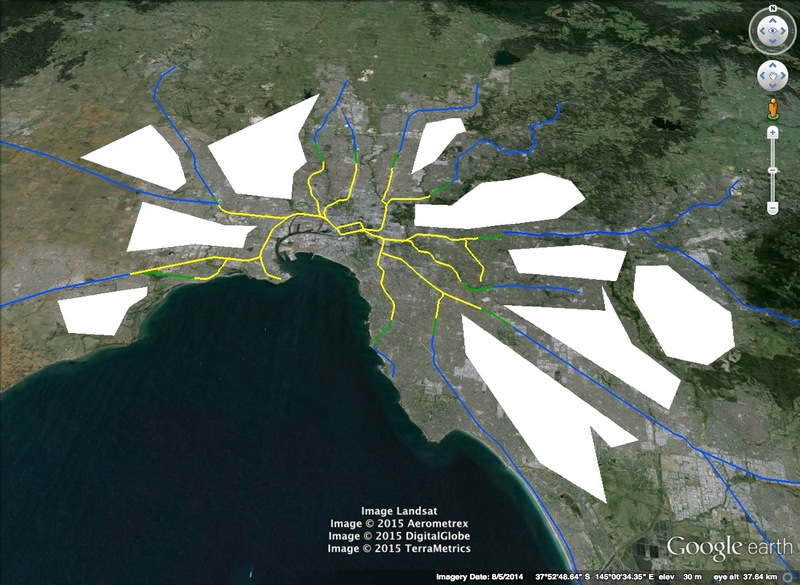 The final fantasy of VicRoads freeway engineers I intend to ever allow this city. By their own arguments that's it, once they've got a complete outer orbital ring road and East West Link, they are out of ideas. But we will see next time, ALL my suggested roads improvements are calibrated to ALSO interface with the public transport network, delivering SIGNIFANCTLY better bang for infrastructure buck. Accordingly, this "second outer circle" would "borrow" the same road tunnel we intend to build for the section between Ringwood and Watsonia or thereabouts. 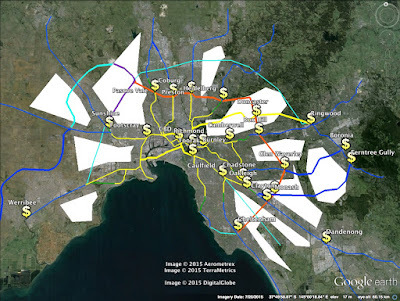 Finally, the obvious thing to do out West would be extending the RRL route to the airport, and the new airport line through to the Werribee line in order to both cater for growth, and maximise the number of metro-style linkages across the network. To this. A fully integrated metro system that addresses those blackpots directly. "Leave no Melburnian Behind", should be the catchcry, where transport access is concerned. Because it's actually a MAJOR social justice issue. This is about who gets to participate in and integrate with a huge, modern, networked economy, and who gets left behind permanently. In part four, which I'll have ready in a mere couple of days LINK HERE ONCE LIVE, we'll look at how all this looks integrated with the roads network. Bring a cut lunch and a spare pair of socks. the ones you're wearing will be going into orbit.